Has this ever happened to you, you drive all over town visiting different record stores to buy some vinyl's only to find that the selections you wanted are not available or way too expensive and the only ones that are reasonably priced are in really bad condition. You end up buying a bunch of vinyl's and can't believe how much additional tax you have to pay on these items. Or you buy a vinyl on-line through a web-site, end up paying way more than you wanted for the vinyl, and then you are stuck having to pay the additional cost for the shipping and custom duties. 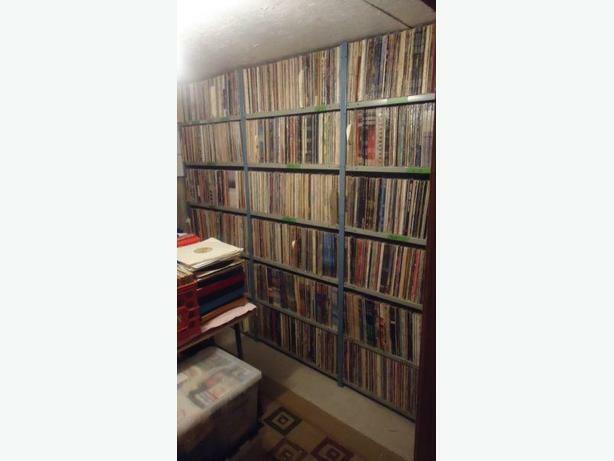 Well here's your chance to put all that in the past, I have a large private collection of over 20,000 vinyl's from all different types of music, classic rock, dance, pop, metal, blues, hip hop, house, funk, jazz, soul, reggae, progressive, punk, classical, big band, crooners, soundtracks, comedy, country, international, ect ect... that I am selling to private collectors who would like to pick up some vinyl's at a fair and reasonable price. Included in this lot are over 16000 selections that are priced at 2.50$ as well as other selections priced higher and over 4000 45's at 1$ or more. If you would like to receive my list which contains what is available, the number of copies I have and the price of each vinyl, just let me know and I would be glad to send it to you. If you are interested just let me know which vinyl's you would like and I can grade them and reserve them for you but I do have a minimum purchase of 50$ per order.